It is a matter of dogma, concerning the Most Blessed Trinity, that God the Son is eternally begotten by the Father (“God from God, Light from Light, true God from true God“). It is a matter of dogma that the Holy Spirit proceeds from the Eternal Love between the Father and the Son (“I believe in the Holy Spirit, the Lord, the giver of life, who proceeds from the Father and the Son“). The Holy Spirit is the fulfillment or “terminus” of the Holy Trinity, and therefore (unlike the Father and the Son) He does not bring forth (to use human terms) another Divine Person, except through Mary in the Incarnation! The Holy Trinity chose to take its “repose” in Mary in order that the Holy Spirit could bring forth a God-man, Jesus Christ, through the unspeakable grace of the true and never-ending maternity of Mary Immaculate who is, and will always be, the Mother of God. Through Mary’s consent, the Holy Spirit’s shadow covered Mary, and she conceived our Savior in her womb (Luke 1:35). Even now in Heaven she is truly the Mother of Jesus Christ. Although we are all adopted sons and daughters of God through baptism, Mary is, as Saint Maximilian Kolbe points out, the actual Mother of God! There is, then, a unique and special relationship between Mary and the Holy Trinity that far exceeds in profundity our understanding. We can only approach this mystery in love. “The predestination of the Blessed Virgin as Mother of God was associated with the incarnation of the divine word: in the designs of divine Providence she was the gracious mother of the divine Redeemer here on earth, and above all others and in a singular way the generous associate and humble handmaid of the Lord. She conceived, brought forth, and nourished Christ, she presented him to the Father in the temple, shared her Son’s sufferings as he died on the cross. Thus, in a wholly singular way she cooperated by her obedience, faith, hope and burning charity in the work of the Savior in restoring supernatural life to souls. For this reason she is a mother to us in the order of grace. January 1, 2017 is the feast of the Solemnity of Mary, the Holy Mother of God. Let us begin the new year by drawing closer to the maternal heart of Mary. “In Mary’s case we have a special and exceptional mediation…Jesus Christ prepared her ever more completely to become for all people their ‘mother in the order of grace’ ” (Saint Pope John Paul II, Mother of the Redeemer, 39). Sources: I am relying on Chapter One of True Devotion to Mary by Saint Louis DeMontfort, and also on Aim Higher, Spiritual and Marian Reflections of Saint Maximilian Kolbe. I am indebted to these two saints for the content of this note. Thank you, Mother Mary, for these two great saints! 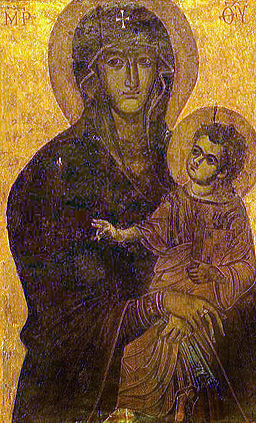 Image: Per Wikipedia, “The Salus Populi Romani icon in the Santa Maria Maggiore Basilica in Rome, overpainted in the 13th century, but going back to an underlying original dated to the 5th or 6th century.” Author unknown. Public Domain, U.S.A.